The Small Firms Association has brought together over 350 small and large businesses at a special event in the Aviva Stadium. “Business Connect” provides a platform for companies to learn how they can win contracts with larger companies and how to position themselves correctly to deliver value. 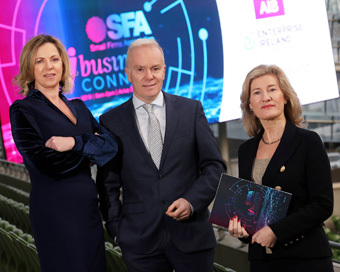 Speaking at the event today, Sue O’Neill, SFA Chair, stated: “Ireland is a nation of small businesses, with 98% of small firms employing half the private sector workforce. Our multinational base, despite only accounting for 2% of businesses employs the other half. Today’s Business Connect event brings together small and large companies based here in Ireland to start a conversation on how they can harness this unique ecosystem. Multinationals currently source €4.5 billion of goods and €5.7 billion of services from indigenous businesses. It amounts to 18% of their total spend on goods and 7.3% of their total spend on services. There are huge opportunities for small business to collectively increase that spend, by looking at how we pitch our services, understand how both large and small businesses operate and strive to bring real innovation into our businesses and into what we offer. Pictured (l-r): Sue O’Neill, SFA Chair; Richard Curran, MC; Catherine Moroney, Head of Business Banking, AIB.